Looking for the perfect vodka crystal shot glasses set to give as a gift? The staff here at Simply Vodka have picked out a few of our favorites to help assist our readers in finding the perfect crystal shot glasses sets. See below to learn more about the three crystal shot glasses sets that we have decided to feature on our site. We have two options that are in the more common price range for giving gifts and one more expensive option for those looking to spend a little more money on their crystal shot glasses. Many of these sets are “dishwasher-safe”, however we recommend hand washing all of your crystal! It does not take very long to hand wash a few shot glasses so why risk damaging them? If you know of any other quality crystal shot glasses sets then please share them with us using the comments section below. We hope you enjoy sipping some vodka out of whatever crystal shot glasses you decide to purchase! Why settle for cheap knock off crystal shot glasses when there are numerous reputable (and affordable) gift options available? Our first recommended gift set of crystal shot glasses is this set of 6 Russian cut crystal shot glasses 35ml and they are even hand made! These shot glasses measure 2.5″ tall and are a great set to give as a gift! We found this set to be the best bargain for the money at its current price of $34.90 for a set of 6 crystal shot glasses. Are you looking to spend more than average on your crystal shot glasses set? 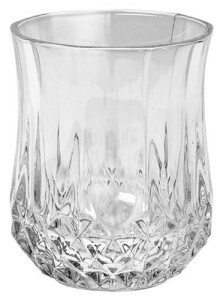 Check out these exquisite shot glasses by Waterford Crystal! This pair of shot glasses from the Waterford Giftology – Lismore Diamond collection are sure to impress! These shot glasses are approx. 3.5″ tall and hold almost 3 oz when filled all the way to the top. These shot glasses are great a great gift solution! Note – Hand Washing Recommended. These shot glasses are of the finest of quality, however it shows with the current pricing of $75 for 1 pair of crystal shot glasses! Yet another example of why you should not settle for some cheap knock off crystal shot glasses sets! Check out the cristal D’Arques Longchamp collection of crystal glasses! 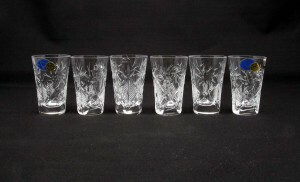 This set of 6 crystal shot glasses is designed and made in France. The deep, diamond cuts refract light with brilliance! 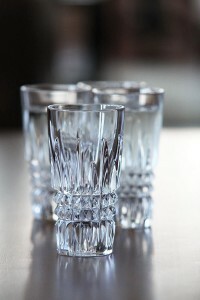 Made from diamax, a lead-free glass, these shot glasses hold 1 1/2 oz. each. If you are looking for smaller shot glasses then look no more! This set of 6 crystal shot glasses is currently selling for just over $20!